This guide was written mostly Molten-WoW in mind, but supports all the 3.3.5(a.) WoW servers (private). Balance Druids are the RDPS spec of the druid tree. This spec should be (more than) viable for levelling your Druid all the way to 80. However, you will have to rely on cloth gear for the most part, as caster leather gear is extremely rare until Outland. Given that, you may want to level as Feral until at least 40 (when you get Moonkin Form, or « Boomkin« , as some refer to) or even 60 (when the gear selection becomes more appropriate). 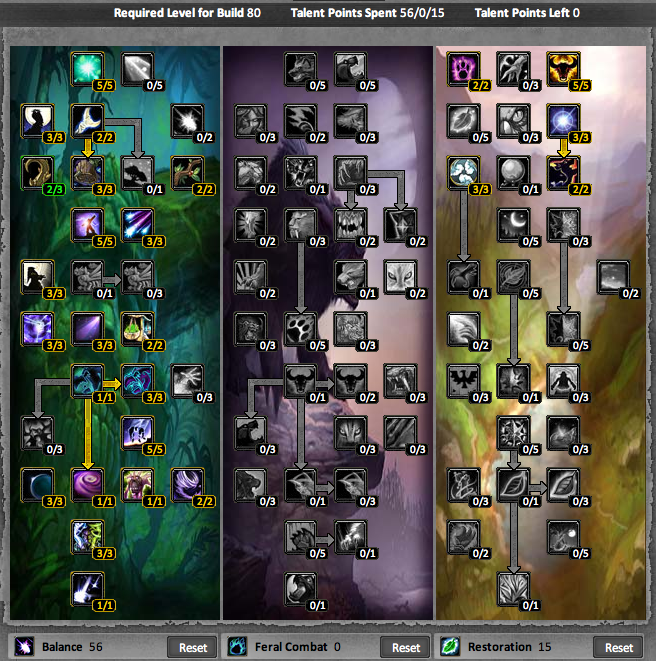 If you do, check out the Druid Feral 1-80 Leveling Talent Build (3.3.5). The Feral talent build is also overall faster to level (as it has nearly no downtime at all), and most would even claim it to be a lot easier. -Always start at max casting range. Take whatever weapons provide the best DPS you can find (probably a staff or 2-handed mace). You’ll be doing some melee damage for a while. – Until you get Moonfire, spam Wrath until the target is in melee range. Rotation – Pull with Wrath, cast Moonfire, spam Wrath. Refresh Moonfire if needed. – Open with Wrath and Moonfire, then immediately cast Entangling Roots. – Spam Wrath until Entangling Roots breaks and the target gets to you or is dead. – When fighting multiple mobs, use Moonfire followed by Entangling Roots on one. Then, focus on other mobs, healing as necessary. Rotation – Pull with Wrath > Moonfire, then Entangling Roots. Spam Wrath. Start trying to find a weapon that increases spell power and/or intellect. If you get a one-handed weapon, get an off-hand to go with it. – Open with Starfire, then spam Wrath.Rotation – Cast Starfire, then spam Wrath. – For single targets, the rotation is the same as above. – For multiple targets, use Hurricane. Either run into a group or pull using Starfire/Wrath/Moonfire. – Once you get Barkskin at 44, use it before using Hurricane. – Use Force of Nature on groups or tough mobs. Warning – Make sure you damage whatever it is your trees are fighting. If you don’t, you won’t get any experience or loot! Rotation (Single Target) – Cast Starfire, then spam Wrath. Rotation (Multiple Targets) – Run into a group (or pull multiples to you using Moonfire), cast Barkskin then Hurricane. Re-cast Hurricane as needed. At this point, we have a change in our single target rotation. – For single target, the rotation is the same as above except if Eclipse (Lunar) procs. – Start casting Starfire instead of Wrath if Eclipse (Lunar) procs. – Use Typhoon to knock approaching mobs back or to pull several at once. Warning: The range of Typhoon is bigger than the animation (sometimes there might be no animation whatsoever) might suggest. Practice using it a little before taking it to the « real deal ». Rotation (Single Target) – Cast Starfire, then spam Wrath. If Eclipse (Lunar) procs, switch to Starfire. – Same as above, except you should use Starfall for extra DPS on groups. Warning: The range of Starfall is surprisingly big, and that is why it is to be used with caution! Rotation (Multiple Targets) – Run into a group (or pull multiples to you using Moonfire), cast Barkskin then Hurricane. Re-cast Hurricane as needed. Use Starfall as often as possible. – Use Hibernate as crowd control needed on beasts and dragonkin (note, feral druids in an animal form + shamans in ghost wolf are concidered as « beasts »). – Use Entangling Roots if you need to get some distance between you and something trying to hit you. – On bosses, open with Faerie Fire, followed by Moonfire. Then, follow your normal single-target rotation (excluding Entangling Roots). Keep Faerie Fire and Moonfire refreshed. – Tribal Leatherworking is a great way to go if you’re leveling as balance. There are some nice BoP (Bind on Pickup) pieces for balance. – Skinning complements well leatherworking, as it allows you to harvest your own materials (saves A LOT of gold). Skinning also gives a nice critical chance buff (+5%). 1 – Spell Power: Needed to directly increase damage. 2 – Intellect: This stat gives you more mana, as well as increases your spell power and spell critical chance. 3 – Critical Strike: Higher Critical Strike chance means you will « crit » more often. 4 – Stamina: This helps you stay alive longer. Especially useful if you encounter a lot of « hostile opposing faction members » -> PvP. 5 – Mana per 5 (Mp5): Helps keep your mana up, even while casting. 6 – Spirit: Also used to keep your mana up, but not effective in combat. 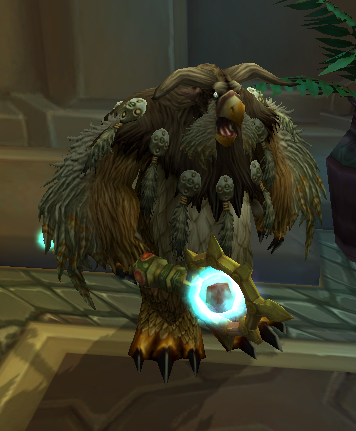 Once you get Improved Moonkin Form, spirit will increase your spell damage though. Glyph of Wrath (colère)- Increases the damage done by your Wrath by 10%. Glyph of Innervate (innervation) Innerva- Grants you 45% of your base mana pool over 10 sec in addition to the normal effects of Innervate. Glyph of Starfall (météores)- Reduces the cooldown of Starfall by 30 seconds. Glyph of Entangling Roots (sarments)- Increases the damage your Entangling Roots victims can take before the Entangling Roots breaks by 20%. Glyph of Aquatic Form (forme aquatique)- Increases your swim speed by 50% while in Aquatic Form. Glyph of Unburdened Rebirth (renaissance apaisante)- Your Rebirth spell no longer requires reagents. The gear listed below are just suggestions. There are plenty of other choices out there. If possible, try to upgrade your gear every 10 levels or so. From 1-57, you’ll probably be wearing cloth gear since there isn’t much in the way of spell leather in Vanilla WoW. The biggest exception is the Embrace of the Viper set that drops from the Wailing Caverns instance. After that, the next major pieces of caster leather are the Ironfeather set. Once you get to Outland, there are plenty of pieces of spell leather. The first you should be able to get are pieces of the Wild Draenish set. Once you hit Outland, you’ll find several upgrades available through quests. If at all possible, get a group to do the Ring of Blood quest line at 65 for the reward. At 75, do the Amphitheater of Anguish. *Cure Poison can be skipped in favor of Abolish Poison at level 26 but still has some use in PvP (apply Abolish for the tick and spam Cure to get poisons in between ticks). **The Aquatic Form quest is now optional, you can train this form directly from the Druid trainer. *** The Swift Flight Form can be trained at level 71 but the quest is still worth doing if you have the time to unlock Anzu. – ControlFreak : ControlFreak is a lightweight addon that allows you to set a target for your CC spells, as well as monitoring their status to let you know if they break the cc or take damage. You can also re-cast your CCs without actually switching targets. – Range Display : A light addon that shows the distance between you and your target (mob/npc/player). Very useful when you need to know exactly when you are in max range for a Wrath/Starfire spam. Easily configurable as well.